As time passes by this post seems to be getting more and more irrelevant! It was supposed to be a post about Autumn, but the weather is getting distinctly more and more like winter. Autumn is a time of year that I have mixed feeling about…I love the colours of the trees and the coolness in the air and the spirit of Christmas on the way but I hate the dark nights and the threat of colder weather to come! 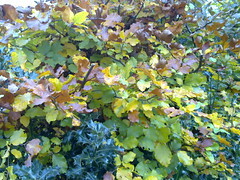 This autumn I have experienced two very different Autumn seasons. In the UK we have the changing of the leaves and the chill in the air but on our recent holiday to Florida is was lovely and warm with bright blue skies. The autumnal sentiment was still present though. I find that in America people tend to celebrate the seasons more than we do in the UK. So many of the houses were festooned with autumnal wreathes and garlands, just lovely! 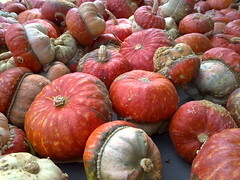 These unusual pumpkins were part of a fabulous display in the town of celebration in Florida. A warming bowl of pumpkin soup anyone?